What’s the last activity you did as a family, one where everyone got together just to have some fun? Not the obligatory soccer game or science fair, but a “Let’s play!” kind of a day. Now think about this: Did it involve any physical activity? Tiesha DiMaggio, program director of the RoseGarden Ice Arena, has a suggestion: Consider ice skating. A lot of us have fond memories of skating as kids, whether we laced up and stepped onto a pond in the neighborhood or headed to a rink. But for whatever reason, we may not think much about ice skating as adults. What’s that? You’re kind of afraid? It’s been years since you stepped out on the ice, and the thought of getting out there as an adult is, well, sort of intimidating? DiMaggio notes that there are solutions, including protective equipment and lessons. “Don’t be shy about protective equipment,” she said, adding that most everyone has a helmet. And she pointed out that there are now compression wear headbands that look like winter wear, but with compression foam in them. DiMaggio said people should also always bring gloves and one pair of thick, well-fitting socks to the rink. Wicking socks are great, but any sock with no ribbing is good. And by all means, wear ONE pair only – DiMaggio said people some in wearing several pairs of socks, which makes the skate fit improperly and also makes your feet sweat. She also stressed the importance of getting your skates sharpened. If you buy a pair from a large store or a generic retail shop rather than a certified pro shop, they are NOT ready to go right out of the box. The blades won’t bite into the ice and that first push-off could come with a nasty surprise. “It’s like being on the ice in stilettos,” DiMaggio warned. You can of course rent a pair of skates at the rink as well as sign up for a variety of lessons. These include trial lessons or one-offs where kids can prep for an upcoming birthday party, to multi-month packages and adult lessons. “It’s never too late to learn to skate,” DiMaggio said, adding that there are quite a few adult skaters in the rink club, including a few who have competed at adult nationals and sectionals. Not that you have to be a budding competitor to sign up for lessons. On Friday nights, RoseGarden offers a combination of lessons at the same time, including adult learn-to-skate and hockey learn-to-skate sessions. This allows families the ability to participate in their different groups but still be together. Training packages are typically for children who do private lessons, as well as a class, and the arena offers multiple day discounts and discounts for families – so mom might go one day and kids go two other days, for example. The arena offers 9-week sessions for about $180. 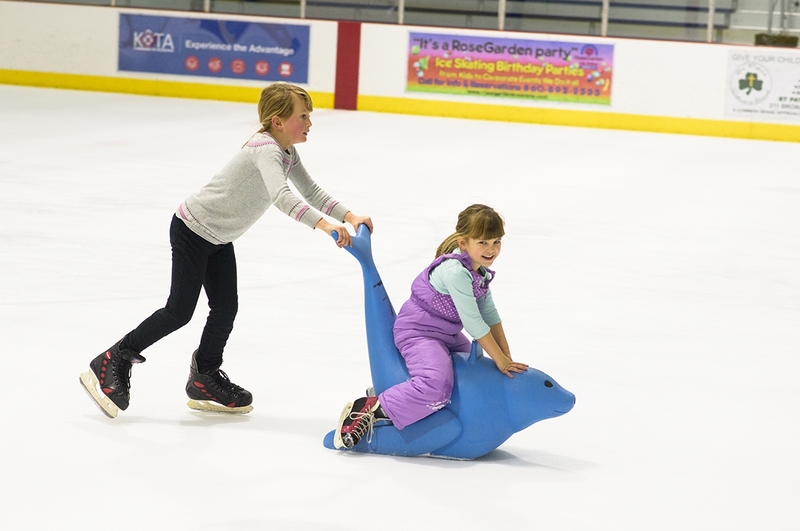 Public skate sessions are $7 for adults (age 13 through 64) and $4 for children and seniors; skate rental is $5. The arena also offers group rates. And there is a swap list where people can informally check whether someone is getting rid of equipment or someone else is seeking new skates, then trade among themselves. Walkers (safe skating equipment) for new, young skaters are also available for rental. Double-bladed skates are not allowed because they can’t be sharpened and are too dangerous for an ice rink with its smooth surface; DiMaggio noted they’re not allowed at most rinks across the country. “They work great on a pond with a lot of sediment, like leaves, rocks, and gunk,” she said, but not on a freshly-Zamboni’d surface. The facility works hard to match coaches to students, and also has one coach who is a special education teacher and works with students who have special needs. For more information, visit the arena online at http://rosegardenicearena.com or call 860-892-2555.